A practical field guide to New Zealand's native edible plants which covers over 190 trees, shrubs, herbs, ferns, mushrooms, lichens and seaweeds. As well as information on which part is edible and when this also provides material on how the plants are utilised, particularly by th... read full description below. 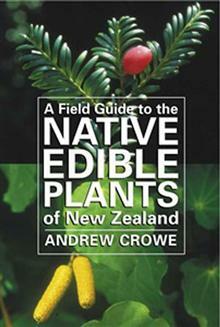 A practical field guide to New Zealand's native edible plants. Over 190 trees, shrubs, herbs, ferns, mushrooms, lichens and seaweeds are described in detail in this useful and attractive book, with information on which part is edible and when, how plants have been utilised, particularly by Maori, their nutritional value, and where they can be found. In a separate section, Andrew Crowe also describes important poisonous plants that are native to New Zealand or are likely to be confused with the edible plants. Illustrated with line drawings and colour photographs, this informative book will be of interest to trampers, botanists and all who appreciate New Zealand's native flora.